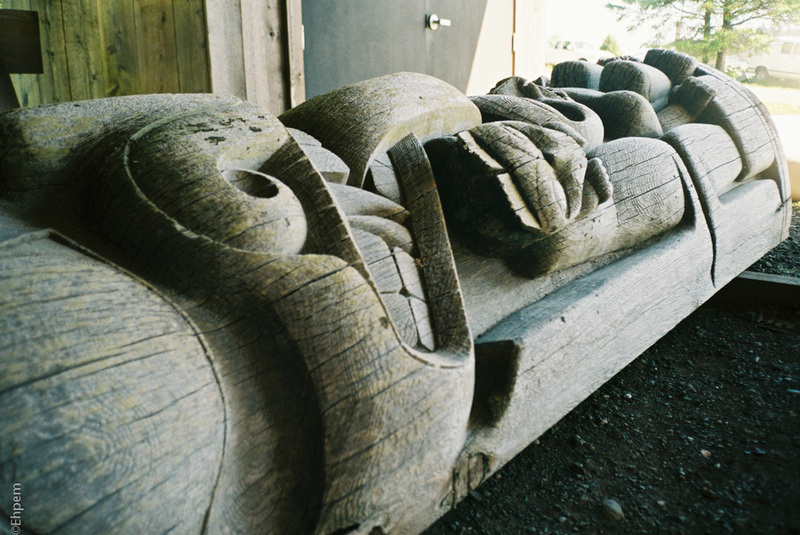 This is Bill Reid’s Skidegate Pole that he carved in 1976 for the village of Skidegate, Haida Gwaii. It stood until a couple of years ago when it was taken down for safety reasons. Currently it lies in carving shed at the Haida Heritage Centre in Skidegate, awaiting conservation so it can stand again, this time in the pole gallery in the Heritage Centre’s Museum. I’ve seen Bill Reid’s work, and it is beautiful. I hope they get this back up and out where people can appreciate it. Meanwhile, this is a very nice photo – an angle you usually don’t see for a totem pole. I agree, though in the carving shed it is more accessible than when it is in the totem hall inside the museum, and on the other side of the cashier. But they are designed to be seen standing, not horizontal so it will be great to see it standing again.